Selçuk stands on the oldest site of Ephesus, the ancient city which was moved twice due to the silting up of its harbour on the River Cayster (today called Küçük Menderes, "Little Maeander") before eventually being abandoned altogether. Archaeological finds point to settlement by Anatolian peoples long before the arrival of the Ionian Greeks in 1000 BC. It is thought that the earliest inhabitants lived on the acropolis or Citadel on top of the hill now known as Ayasuluk. At that time the Aegean Sea lapped at the western foot of this hill. Now the coast is over 5 km away, with flat marshy land in between. During Greek and Roman times Ephesus' main claim to fame was the fabulous Temple of Artemis, one of the Seven Wonders of the World. The sanctuary and temple of this mother goddess was actually rebuilt at least twice, but always remained on the same site despite the removal of the city. Since prehistory it was a primary religious centre and an important place of pilgrimage. Its remains, one reconstructed column and a few stones standing in a swamp on the edge of Selçuk, can be seen as sad or inspiring, depending on your powers of imagination and mood. Selçuk and Ephesus also became important places of pilgrimage for Christians since the religion's beginnings. The Virgin Mary and Saint John the Evangelist, apostle of Jesus, are said to have lived here. (The "House of the Virgin Mary" is about 7 km from Selçuk.) By the time Saint Paul the Apostle arrived (around 52 AD) there was already a Christian community, making it one of the founding churches, later to be known as one of the "seven churches of the Apocalypse" due its mention in the Book of Revelations. According to Christian tradition, Saint John the Evangelist, also known as Saint John the Theologian, wrote the Gospel of St. John here, lived to a ripe old age, and was buried on the hill below the citadel. His shrine was replaced by a church in the 4th century, then by the present Basilica of St. John the Evangelist (with dimensions almost matching those of the Temple of Artemis) by the Byzantine Emperor Justinian the Great in the 6th century, around the same time as the building of Aghia Sofia in Constantinople (Istanbul). There is a controversy about the identification of Saint John (or possibly many Saint Johns) as author of parts of the New Testament, which we discuss in the photo gallery pages about Saint John's Basilica. In 1914 the town was renamed Selçuk, in commemoration of the Seljuk Turks who settled in the region in the 12th century. 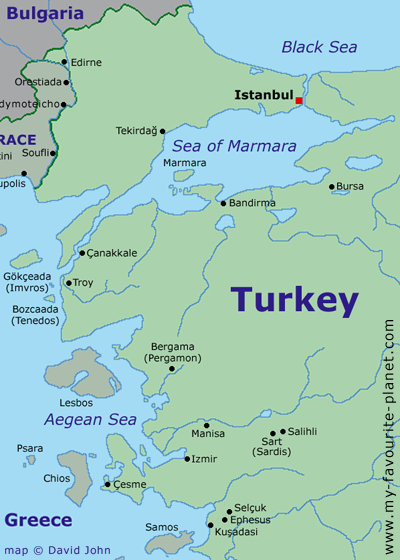 Cockerell visited Ayasluk and Ephesus on 23 March 1812. He admired the İsa Bey Mosque, but was disappointed by what little he could see of ancient Ephesus, most of which, including the Great Temple of Artemis, had yet to be excavated from beneath several metres of silt. "The great mosque, in which are some grand columns of granite, is fine, and, like the others — for there are many in the place — thoroughly well executed in the true Oriental taste." "The remains of Ephesus are very trifling, and what there are, are in a very poor style. I did not, any more than other travellers, find out the Temple of Diana, though of course I have my own opinion as to the site." Travels in Southern Europe and the Levant, 1810-1817: the Journal of C. R. Cockerell, R. A., edited by his son Samuel Pepys Cockerell. Pages 157-158. Longmans, Green and Co., London, 1903. At archive.org.